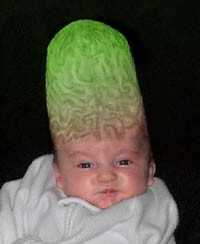 This Halloween, dress your infant up in a brain hat. Not only will he be stylish, but you’ll know his head is warm! 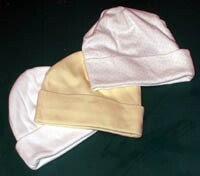 Two stretch knit caps in light colors. Often these come in multipacks. Green paint, either acrylic or fabric paint. 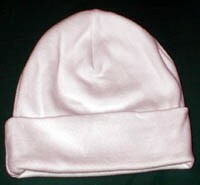 Here’s a standard baby cap. They often have cuffs. If the hat does have a cuff, undo it. There may be a few stitches holding it in place. Turn the cap inside out. 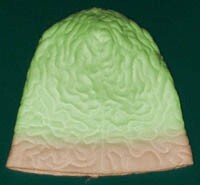 There will probably be seams at the top which create the hat’s tapered look. 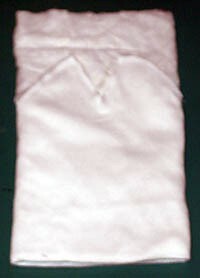 Using a seam ripper, undo the seams at the top. 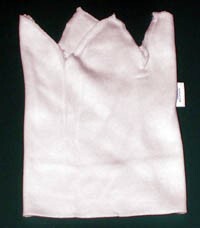 Leave the hat’s side seam intact. 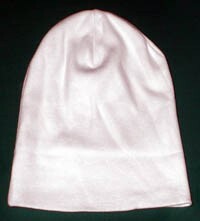 Stretchy baby caps are usually made of one piece of fabric which has been folded in half, forming a double layer. 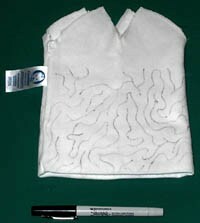 Unfold the cap until it’s only one layer of fabric thick. Wrap batting around one end of the hat, placing one edge of the batting at the crease that was left when the hat was unfolded. Here we’ve finished wrapping the batting all around the hat. 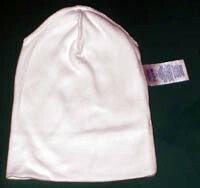 Fold the lower half of the hat up so that it covers the batting. You should now have a fabric tube that is filled with batting. Moving around the tube, pin the batting and fabric together so that they won’t shift. Trim the exposed batting to match the raw edges at the top of the hat. Using a pencil or fine-tipped permanent marker, drill meandering quilting lines on the inside of the hat. Looking at a picture of a brain may be helpful. 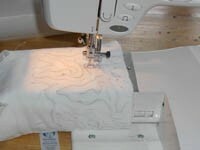 Sew along the quilting lines using a sewing machine or by hand. 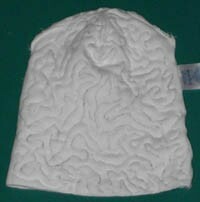 This is easily done by lowering or covering the feed dogs on your machine and using a darning foot, but it does take some practice. After quilting, the hat already looks amazingly brain-like. Sew the seams at the top closed. Turn the hat right side out. The finished hat before painting. Using very diluted colors, paint the hat. 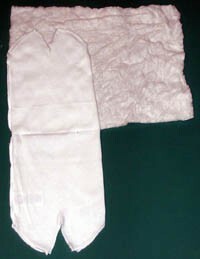 The bottom should roughly match your child’s skintone, while the top should be greenish. Try the hat on your child. If it seems a little limp above his head, insert some stuffing. 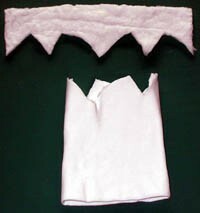 Line the monster hat with a second cap, leaving the second cap’s cuff intact. Whipstitch the bottom edges of the two hats together. Here’s a baby wearing the finished hat. Pair it with a sleep sack for a cutely revolting monster larva effect. If you’re not satisfied with the visible edge between the hat and your child’s forehead, disguise it with a trim or stretchy headband. Metal studs are always very stylish with monster heads. You can also make the edge disappear in photos, at least, using Photoshop or another image-eding program.